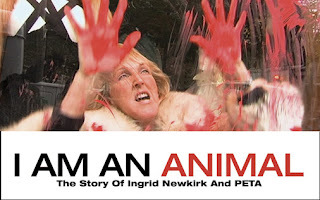 I just finished watching "I Am an Animal," an HBO video about Ingrid Newkirk and People for the Ethical Treatment of Animals. Great movie, fascinating stuff. The most fascinating of the fascinating elements: the story line about people who go undercover into slaughter houses and animal labs to videotape the goings-on. They do the work they completely abhor in order to be in a position to videotape other people doing it. They spend days and months killing chickens, inflicing pain and bodily injury on monkeys, etc., and come out with extraordinary footage that shows both "business as usual" in these places and the excesses of their more sadistic co-workers. Here's what I wonder. Is it a sign of being less than absolutely opposed to these things to be willing to do them even for the purpose of creating damning footage? I can't imagine abortion protestors getting themselves inside clinics and assisting in abortions (or am I wrong about that? has it been done?). I really can't imagine a death penalty opponent wanting to work down at the Huntsville, Texas prison (death penalty capital of the western world). Could it be that the animal activists are less than convinced of their position? I'm going to say that's got to be the wrong interpretation. It's got to be that they have reasoned that it can't possibly do any good for animals for them to keep their hands clean. Somebody's going to take those jobs if they don't. They know their investigations have done a lot of good. But is there any line here...anything a good person just can't possibly do, even for the good of the cause? Hmm. I can't imagine abortion protestors getting themselves inside clinics and assisting in abortions (or am I wrong about that? has it been done?). Not sure. But (some of them) do murder adult human beings. I suppose the difference would be that the slaughterhouse infiltrator is doing something they feel is wrong with the knowledge that in the big picture (the ultimate consequences or utility of their actions) they are helping to put it right, while the pro-life assasin views themselves as killing a non-innocent, i.e. they are driven by the adoption of duty--of what they view as a principle of justice. In any case the boundary of what any individual views as "the line they will not cross" is going to vary wildy on the basis of their moral system...as is the notion of what counts as a "good person"...but that's a truism. Undercover police officers often infiltrate criminal organizations and take part in criminal activities, for example, drug dealing, in order to gather information about criminals for the purpose of arresting them in the future or for the purpose for finding out who the leaders of the criminal group are. That is an accepted part of police work and of espionage. In fact, we would probably consider as a hero an undercover agent who infiltrated Al Qaeda, participated indirectly in some minor actions (without directly killing anyone) and finally prevented a major terrorist action. Ah...but the usual undercover agent, as you say, would be expected to stop short of killing anyone. The animal activist undercover agent does in fact do everything that they're trying to stop others from doing. I'm not criticizing them... but just think it's interesting. You're right. You might compare the animal rights undercover agents to generals who are willing to sacrifice countless numbers of their fellow countrymen, soldiers and civilians, in order to win a war, which they consider to be a good cause. I'm not saying that animal rights isn't a good cause: I'm just not sure if the ends justify the means in this case. I certainly wouldn't work in a slaughter house in order to film it and denounce it. My reluctance has something to do with what Bernard Williams means by integrity. Yes, it's like "Jim and the Indians" except that, since it's real life, not a story, it's harder to agree with Williams. I'm not inclined to think there's any lack of integrity on the part of the undercover investigators. The examples makes you see that having or lacking integrity is a tricky thing to define. Another way to read it would be to agree that the investigator forfeits his integrity, but you might want to say that there are 101 ways to forfeit your integrity. In some cases (surprisingly enough) it's laudable to do so. It's one thing to be tempted into slaughtering chickens for a large sum of money (not admirable), another to do it in order to make a PETA video. I wonder if at PETA HQ anyone secretly holds themselves above these investigators, thinking they are somehow fallen or not as committed to animal rights. Or are they viewed as making the ultimate sacrifice? I'm far from an expert on Williams, but I think that for him integrity is a personal thing, having to do with each person's sense of self, of who he or she is. So my sense of integrity may be different than that of the animal rights activists who infiltrate slaughter houses. I didn't mean to imply that they violated their sense of integrity, which has to do with their sense of who they are, not with my sense of who I am.